Your outfit is perfect. Kisses and have a nice weekend. love the style…you rock this look! I need jeans just like yours! nice bag! Your style is so inspiring, it’s ver versatile but so great! Love your jeans and bag! The same to you!!! Lovely sprig days! Love your jeans! Today best street style of the week! I love red! mix sweaters and shoes for shade – an interesting idea! And I’m delighted with the jeans! Thanks for leaving me a comment, so glad to have discovered your fantastic blog. I love how you work a leather jacket and incorporate colours so effortlessly. Happy weekend! Red is such a fun color to match with. I love Nine West shoes and your red shoes are great! You look very good, these pants are so beautiful on you ;) I love these shoes!! 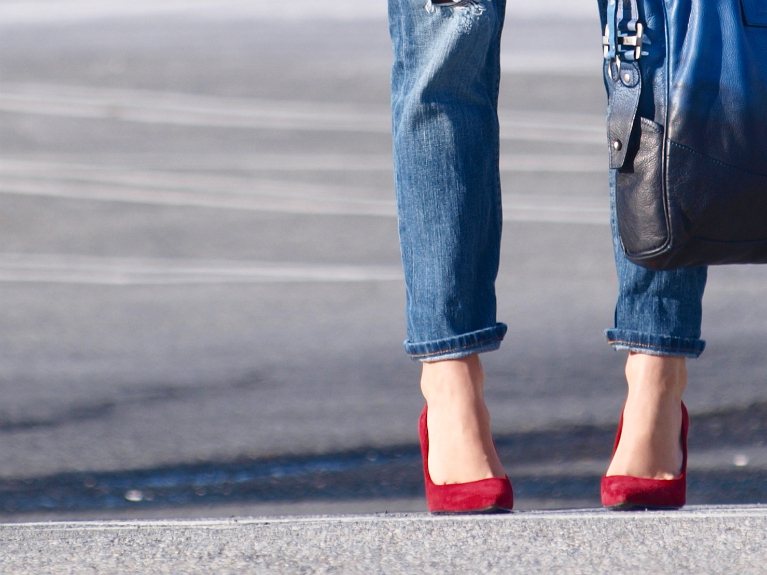 Love the red pumps!! And your back is amazing!! I adore everything about this. Great colors and you always have the most amazing sense of style! That ombre bag is pure gorgeousness!!! Love your tailored looks as well as the dressed down versions…this mix is perfect for a casual day running around town…so chic! Happy Weekend hun! I’ll be glad If you visit my blog! OMG these shoes, I want these shoes! And the ring! You look gorgoeus! This a very nice outfit of you, darling! bag is really awesome ! wow! your bag is amazing!! where did you buy it? the colors are amazing love the entire look !! oh i love this bag madly, so fabulous! I love your red sweater and this color suits you very well. I watched your blog from the beginning to the end…love it. My favourite in this outfit are the red pumps. this is such a perfect outfit! it’s def something I’d wear – everyday :) you’ve got great style! so casual chic…so my style!! !love it!! LOVE that look! Your shoes are so cool!! You look amazing! Your shoes are lovely! Absolutely cool and the red heels are insanely hot! you look amazing as always! I love those pumps. Wow I love that bag!!! like so much your jeans dear! Do check out the ClucbCouture giveaway on my blog Miss Tangerine, it’s the last day to enter and maybe you’ll be the lucky one! I truly loved your ripped denim! It looks absolutely cool paired with a cranberry pair of pumps. Casual yet chic! ps. the cranberry red hue suits you fabulously! i love that bag! must. have. it. Oh, that bag is really gorgeous! LOVE how the blues fade into each other! Love the pop of red. And I adore that bag!! You look amazing! I love the shoes! I love your outfit ! Your jeans is perfect ! This outfit is my favorite! The jacket is awesome! And the bag is out of this world awesome! Love it!